You need people who have a positive attitude and who aim to do professional work. Otherwise you may spend time dealing with people issues, rather than working towards achieving the picture of success. 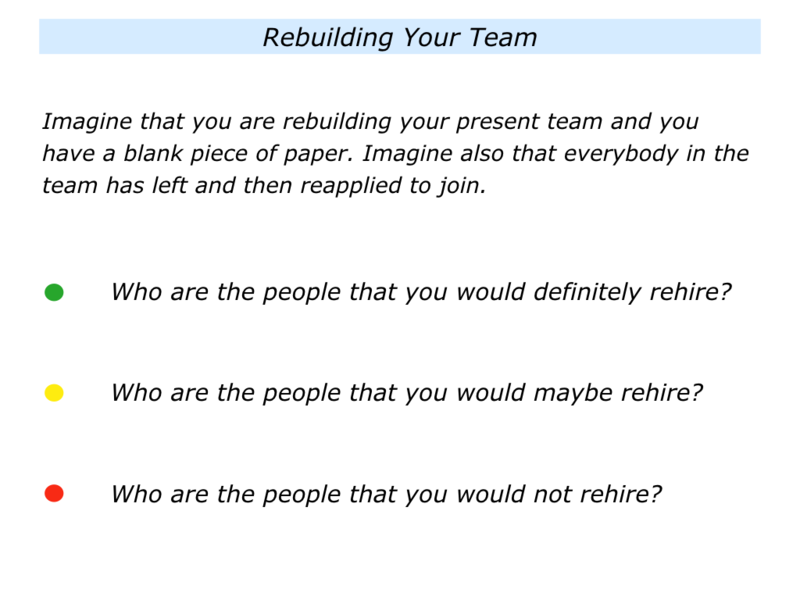 Imagine that you are rebuilding your present team and have a blank piece of paper. 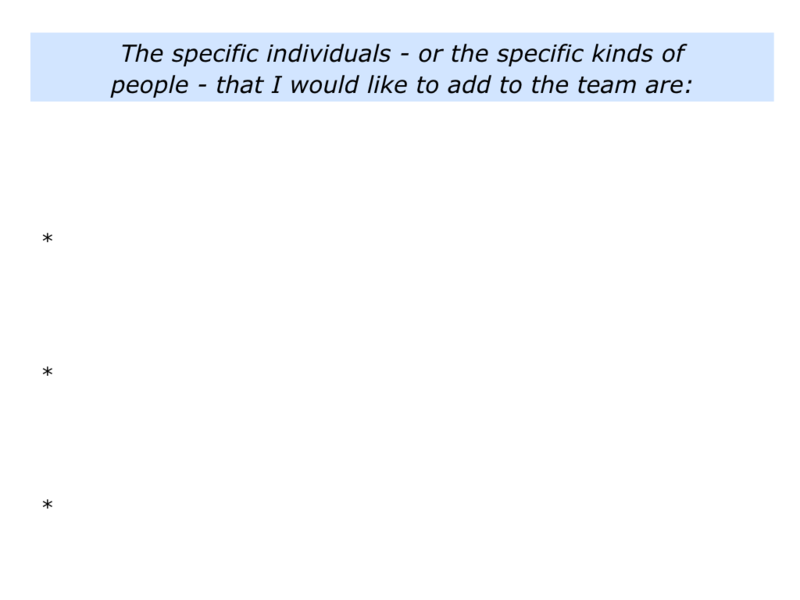 Imagine also that everybody in the team has left and reapplied to join. 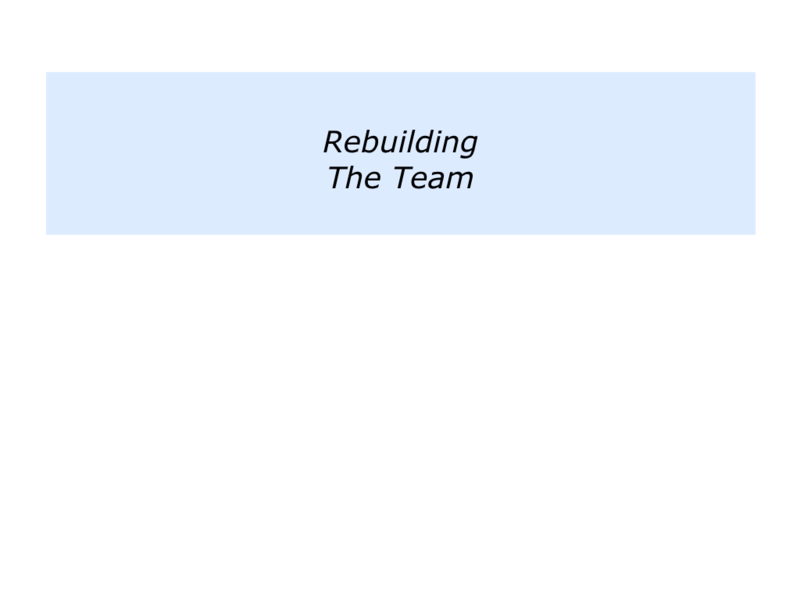 Let’s explore how you can revitalise your team. 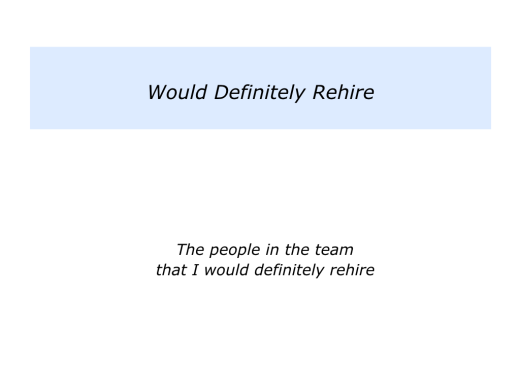 Who are the people that you would definitely rehire? 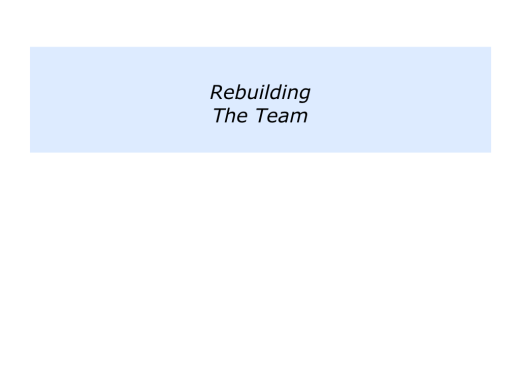 Bearing in mind their strengths, what would you rehire each of these people to deliver? 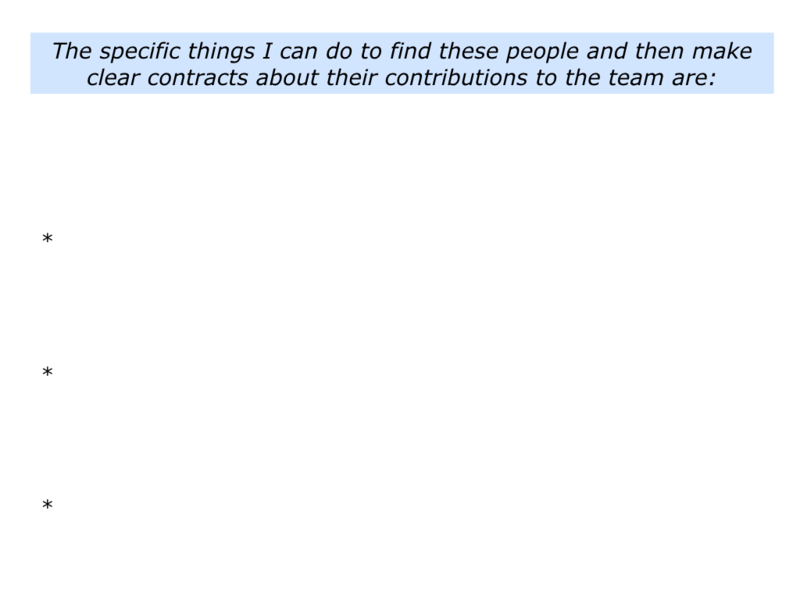 How can you make clear contracts with them about their contributions to the team? You will have your own criteria for making these decisions. Here is the response that one leader gave to these questions. 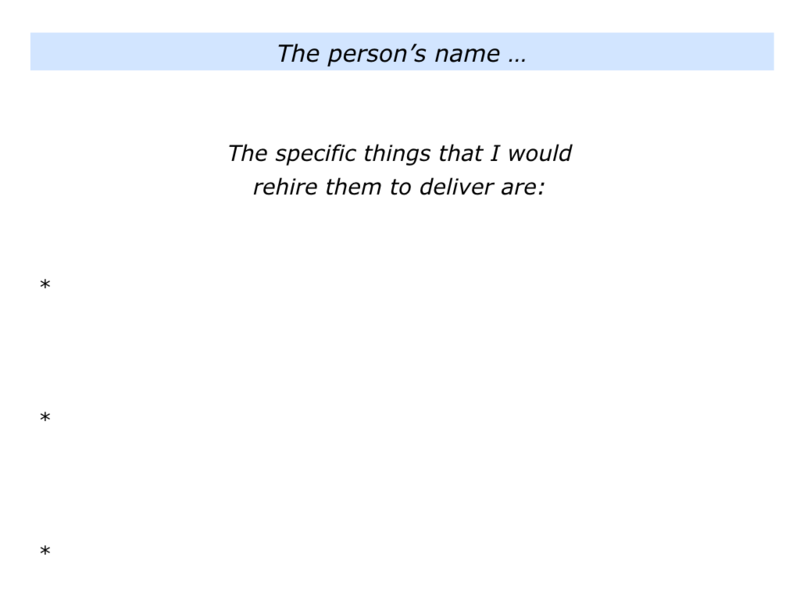 I know exactly the people I would rehire. There are several that form the backbone of the team. Mary, the Operations Director, who makes thing work. Sarah, the Sales Director, who is brilliant with certain kinds of clients. Dave, the Human Resources Director, who focuses on how people can use their strengths to implement the strategy. Looking at the next level, there are at least five people I would rehire immediately, two of whom could step into the leadership team. There are also fine people on Reception and in charge of Facilities. 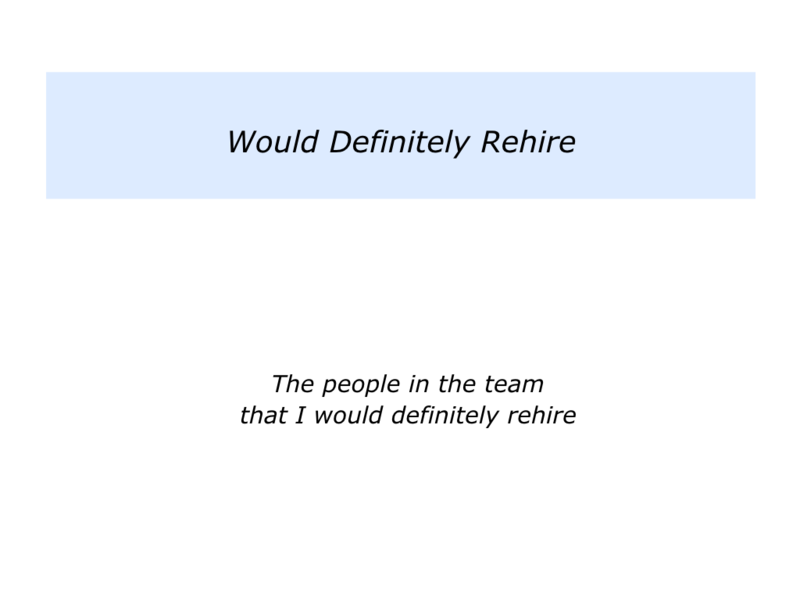 Looking overall, I would rehire about 60% of our people. They already provide the backbone for the company. The specific results they will deliver that will contribute towards achieving the team’s goals. The specific support they need to achieve the agreed goals. The specific things they will do to proactively keep you informed about their progress towards achieving the goals. If you wish, try tackling the exercise on this topic. This invites you to focus on the following themes. 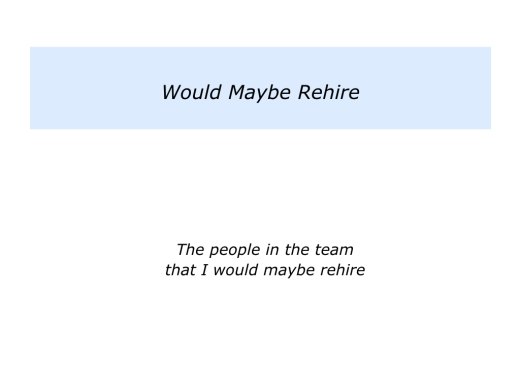 Who are the people you would maybe rehire? 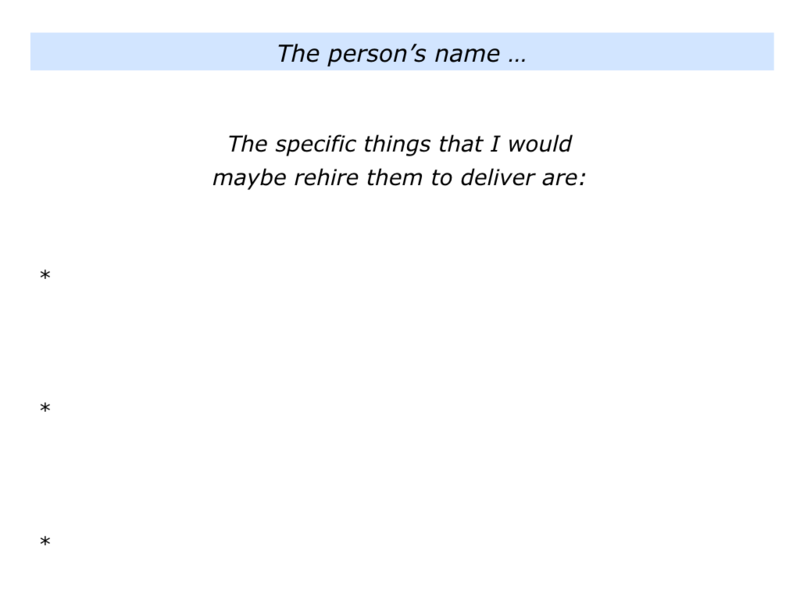 Bearing in mind their strengths, what would you maybe rehire them to deliver? What is the attitude you would like them to demonstrate? What are the professional standards – the Dos and Don’ts – you would like them to bear in mind when contributing to the team? How can you give them these messages in a positive but clear way? How can you then give them chance to reflect and decide if they want to follow these professional guidelines? 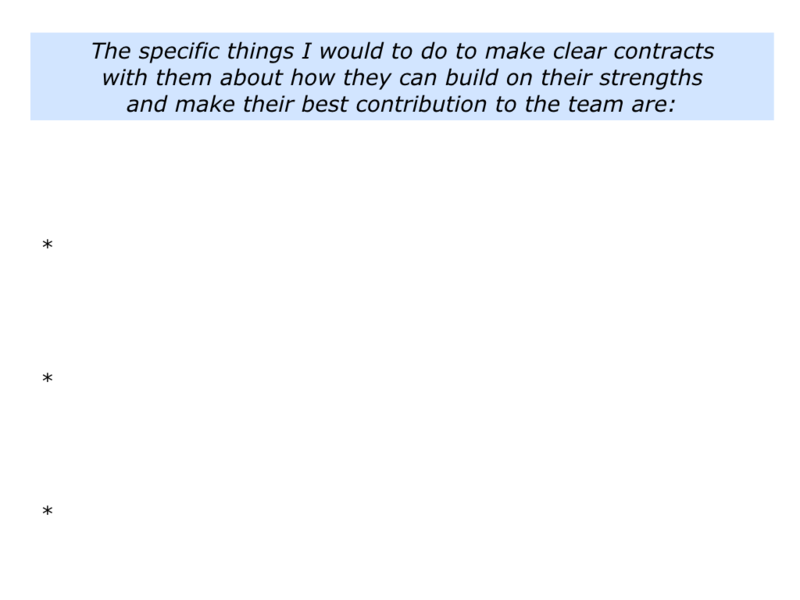 If they want to opt in, how can you then make clear contracts with them about their best contribution to the team? You will have your own criteria for making these decisions. 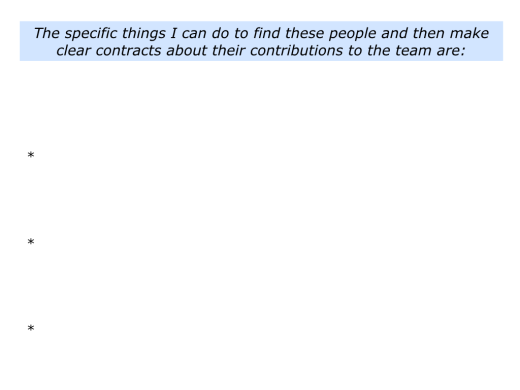 Here is the response that the leader mentioned earlier gave to these questions. There are one or two people I might rehire, but a lot would depend on their attitude. The leaders of our IT department, for example, must become more customer-focused. During the early days we just had a couple of people who took care of the internal systems. At the time they were contractors and really put in the hours. As the business grew, we offered them the chance to lead the department on a full-time basis, which they grabbed straight away. Since then the IT department has grown, but the leaders have become locked into their systems, rather than serving the internal customers. I might rehire the two original people, because they are talented. 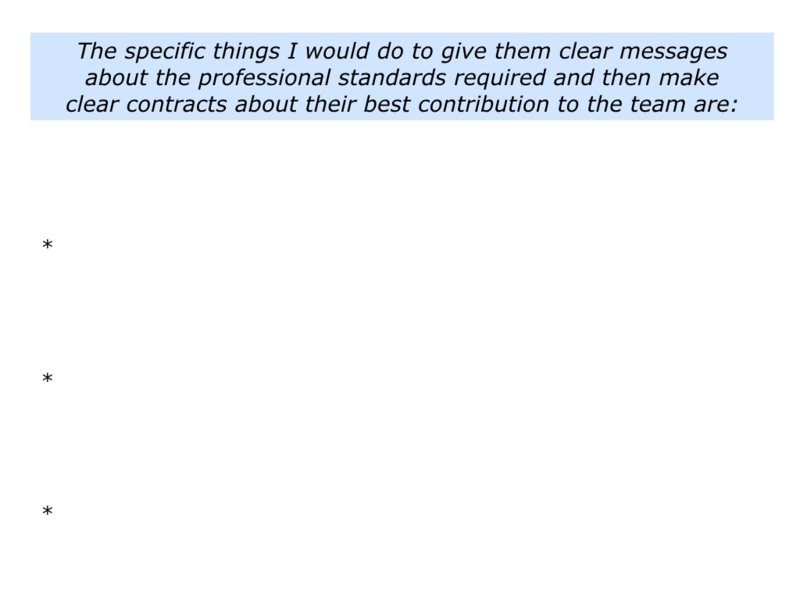 But I would invite them to decide if they want to show the commitment they did when working as suppliers. I will give them the chance to decide if they want to get these kinds of responses from our people. If so, I will invite them to produce a plan to ensure they achieve these goals. I will give them a deadline by which this plan should be produced, but I won’t chase them. If they do not get back to me by the agreed date – or if they produce a plan but fail to deliver the goods – then that is their choice. I will find people who are prepared to deliver the required professional standards. 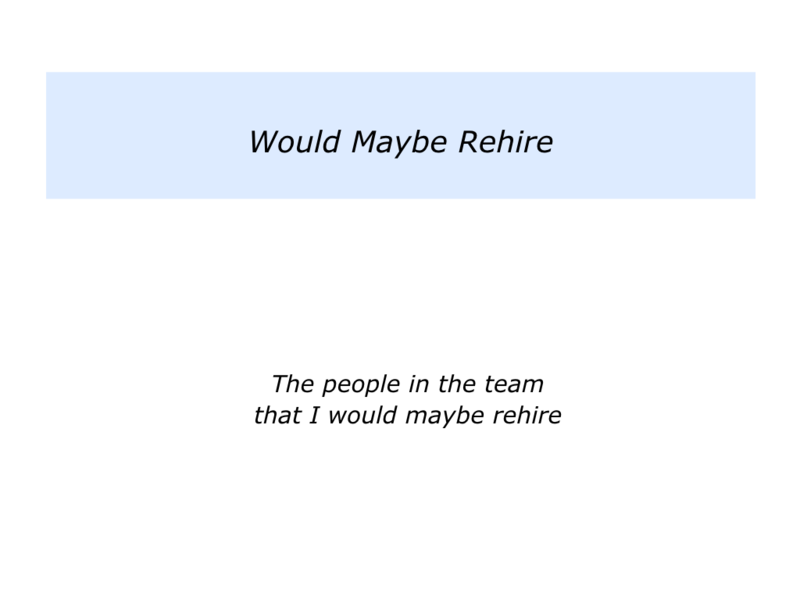 Who are the people you wouldn’t rehire? 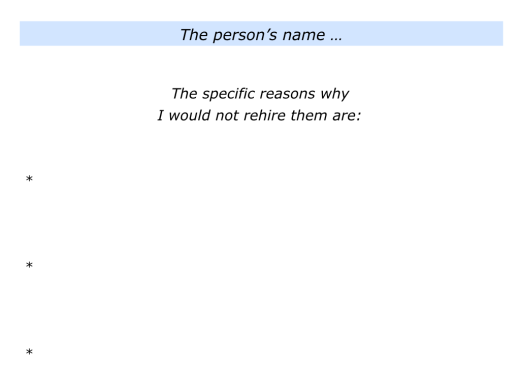 What are the reasons why you wouldn’t you rehire these people? How could you manage these situations in a moral and professional way? 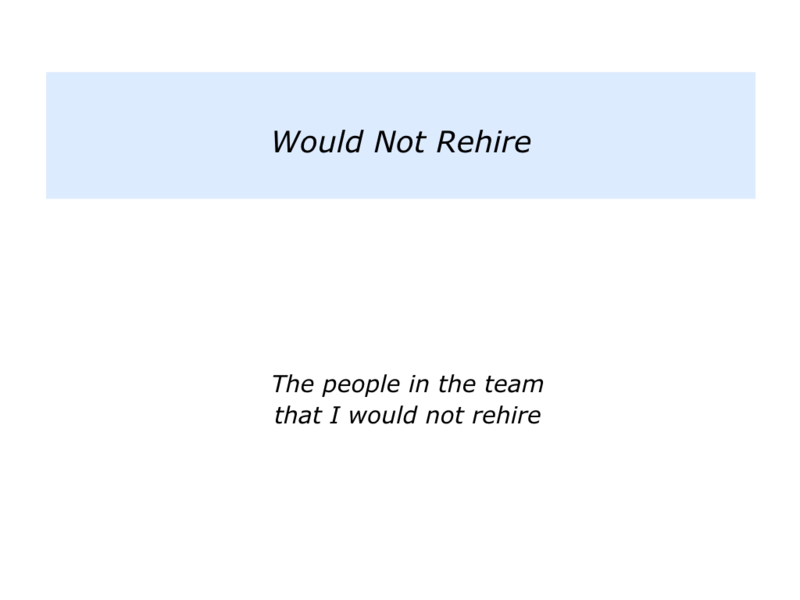 Different leaders give different reasons for not re-employing certain people. Here are some that they offer. They have the wrong attitude. They have crafted a role that suits them, but it does not add value to the company. They rose quickly in the company and got a great financial package. Now the company has changed and we need different things from a person at their level. But they want to carry on doing the same things and drawing a high salary. They are high-maintenance. They expect the company to satisfy all their needs rather than them taking responsibility for making their best contribution to the company. 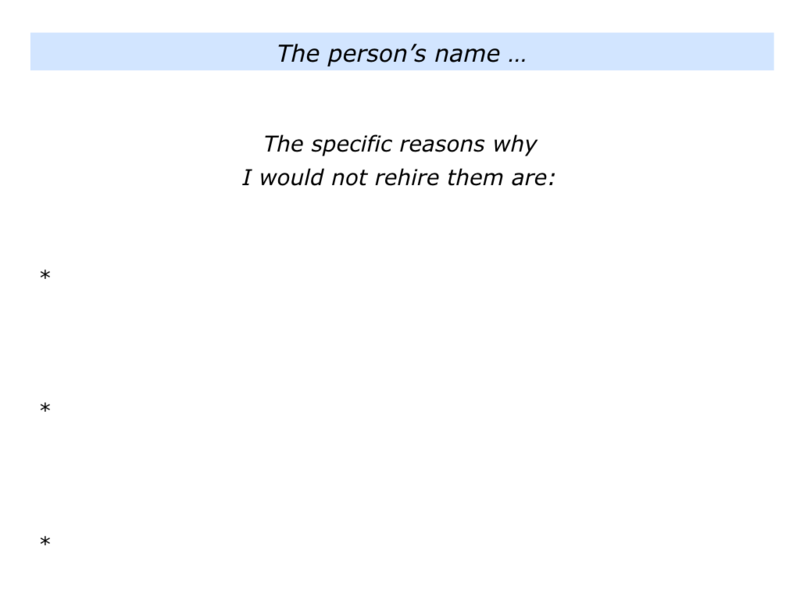 Imagine that you have decided about the people you would not rehire. The next step may be to make sure you handle the situation in a professional way. Different people do this in different ways. One approach is to make sure all the legal areas are covered and also be generous in any package you offer a person. If appropriate, you may then write a script you want to follow when talking with the person. This may include giving them some of the following messages. As you know, the team faces many challenges as it moves forward. 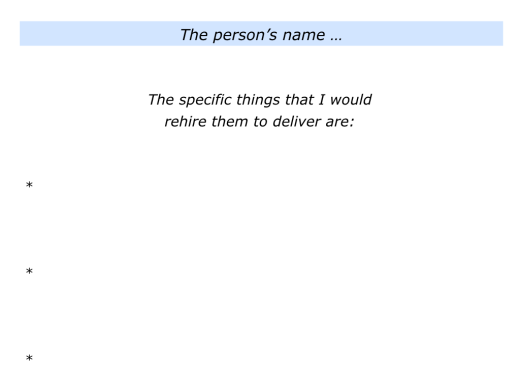 This means that people will need to demonstrate certain qualities to be the right fit with what is required. Whilst you have certain qualities, unfortunately the ones you have do not fit with what is needed in the future team. We will, of course, offer you the best available package to move on. I am certainly prepared to answer any questions you have about the reasons for this decision. Also, we will provide as much support as we can in helping to make the transition easier for you and the team. So, if you want to reflect for a while, please do so. I will then answer any questions you have regarding the next steps for moving forwards. Imagine that you have given a person these kinds of messages. If the person asks for more information about the decision, it is important to be able to give specific reasons. You have certain qualities, but unfortunately have not shown the ones we require in the future. 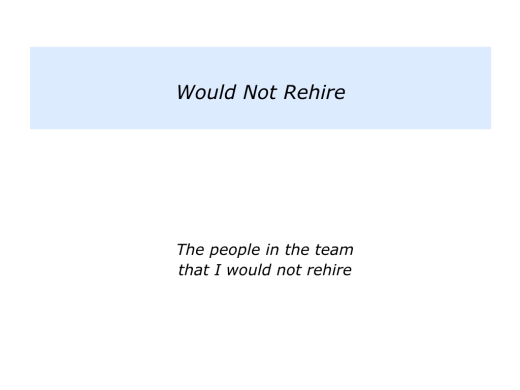 Therefore it is probably not the right fit for you or for the team. 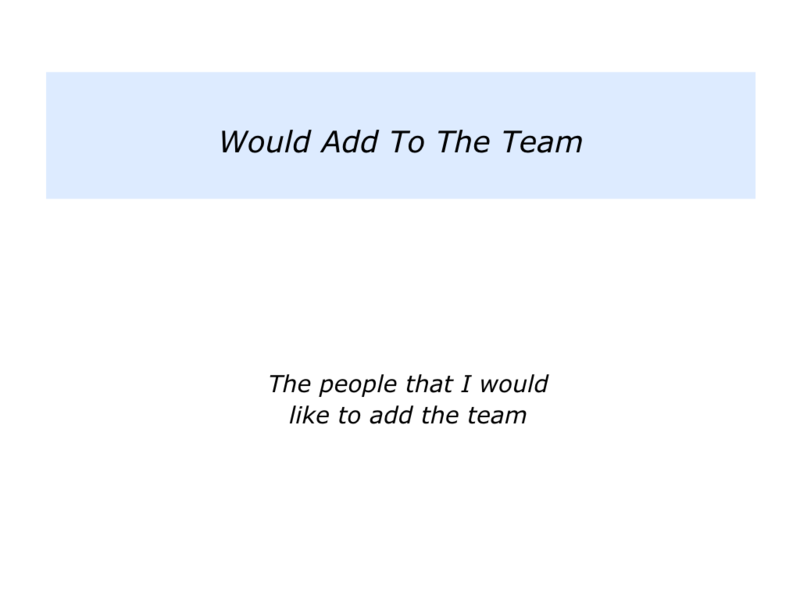 If you wish, clarify the kinds of people you may want to add to the team. 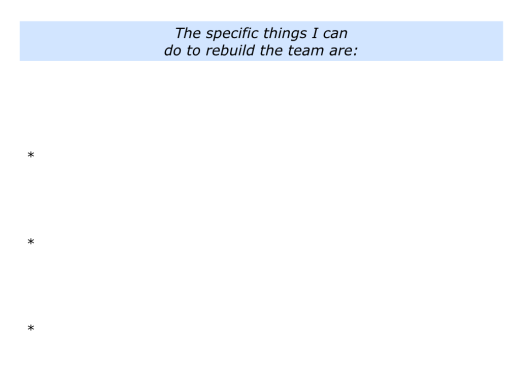 One approach is to look at the team and focus on the following themes. Imagine, for example, that you have many people who are entrepreneurial or experts. They have lots of ideas, but sometimes their efforts are not aligned. You may need to add several eager beavers who are good co-ordinators. They will make sure that people align their efforts and the work gets done. Good leaders are like good sports coaches. They spend a lot of time looking for potential hires. Aiming to get ahead of the game – rather than being left in the lurch- they fill the recruitment pipeline with people who might want to work in their team. The General Manager of one hotel chain I worked with, for example, took notice of people who gave him good service on his travels. If appropriate, he would hand them his card and say something like the following. You gave us great service today. If you are ever interested in developing your career, let me know. Drop me an email and we can have an informal chat over coffee. If you wish, try tackling the exercise on this topic. This invites you to do focus on the following themes. 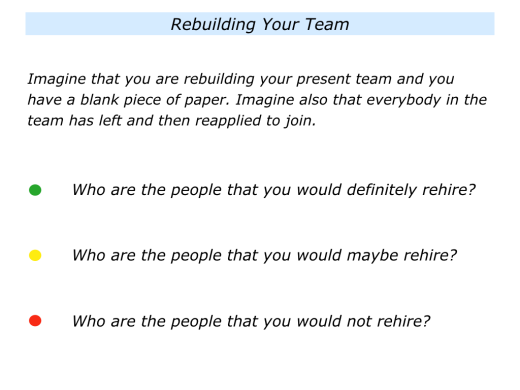 How can you translate these ideas into action and rebuild the team? One person explained this approach in the following way. I do this exercise every year and act on it. At first it seemed a bit scary, but that was because there was so much to sort out. It took six months to get the team right, but now it functions brilliantly. Nevertheless, I still do the exercise to ensure we stay on track. You can rehearse the conversations you are going to have with each person. This is vital. 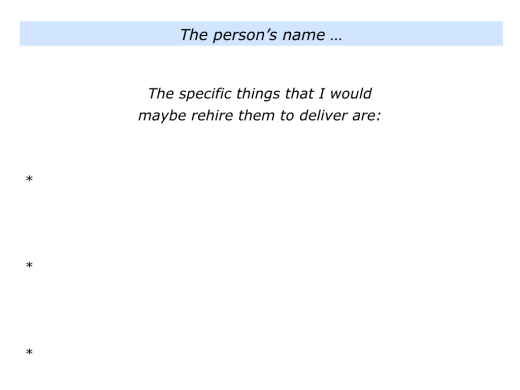 Make sure you are crystal clear on the key messages you want to give to: a) The people you definitely want to rehire; b) The people you maybe want to rehire; c) The people you will not rehire; d) The people you want to add to the team. 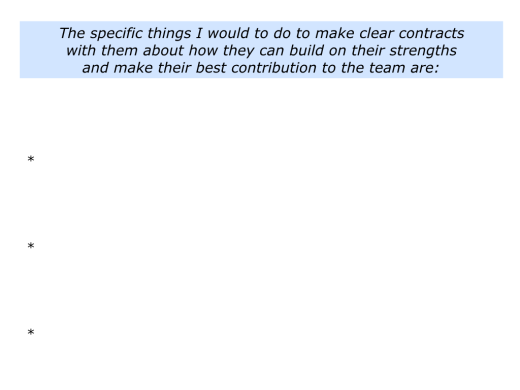 You can rehearse how to encourage and make clear contracts with the people who will be in the future team. This will involve agreeing on the results they will deliver and the support they will need to achieve the goals. Looking ahead at the different types of conversations, anticipate the potential challenges. Rehearse how you can deal with these in a professional way. You can then relax and embark on the conversations. Leaders who take these steps often find they bring benefits. 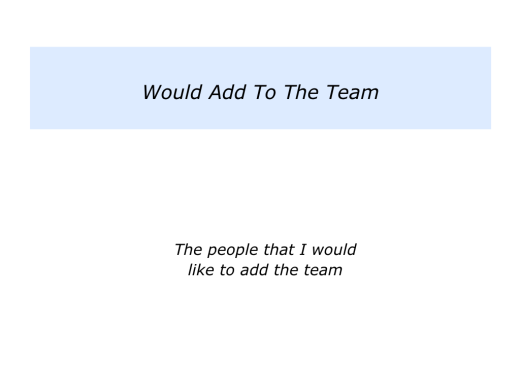 The team is more likely to have people who are positive and play to their strengths. People are also more likely to follow the required professional guidelines and achieve peak performance. This can enable both the individuals and team to achieve ongoing success. If you wish, try tackling the final exercise on this topic. This invites you to focus on the following themes.